Collecting antlers that fall off the heads of deer, elk, and moose each winter is a popular pastime in Utah. Before you head out the door to collect shed antlers, though, you must complete the Division of Wildlife Resources’ Antler Gathering Ethics course. You can take the free course at www.wildlife.utah.gov/shedantler. Fortunately, you can gather shed antlers without stressing the animals or damaging their habitat. “The free course will teach you how,” Shirley says. – print your certificate of completion and then carry it with you while you’re gathering antlers. – take a screenshot of your certificate of completion and then store the screenshot on your phone or another mobile device. You must carry the mobile device with you, with the screenshot saved on the device, while you’re gathering antlers. If you have young children, and you’ve completed the course, your children don’t need to complete it—your certificate will cover your kids too. You must complete the course if you want to gather shed antlers before April 15. If you wait until April 15 or later to gather antlers, you don’t need to complete the course. – Many of the state’s wildlife management areas are closed in the winter and spring, to protect animals and their habitat. – You must have written permission from the landowner before gathering antlers on private land. The DWR will send a conservation officer to investigate. If it’s clear the animal died of natural causes, you might be allowed to keep your find. 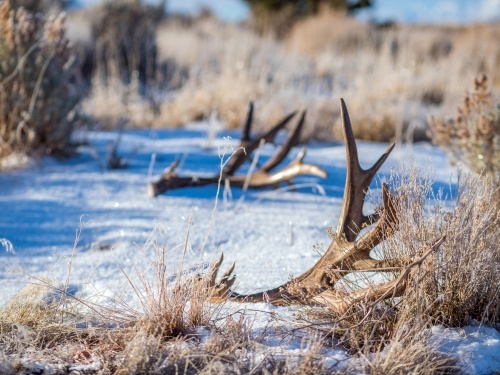 If you have questions about gathering shed antlers in Utah, call the nearest Division of Wildlife Resources office or the DWR’s Salt Lake City office at 801-538-4700.